Looking for some truly remarkable birthday wishes to decorate your dear husband’s birthday celebration? Waste no more time searching. 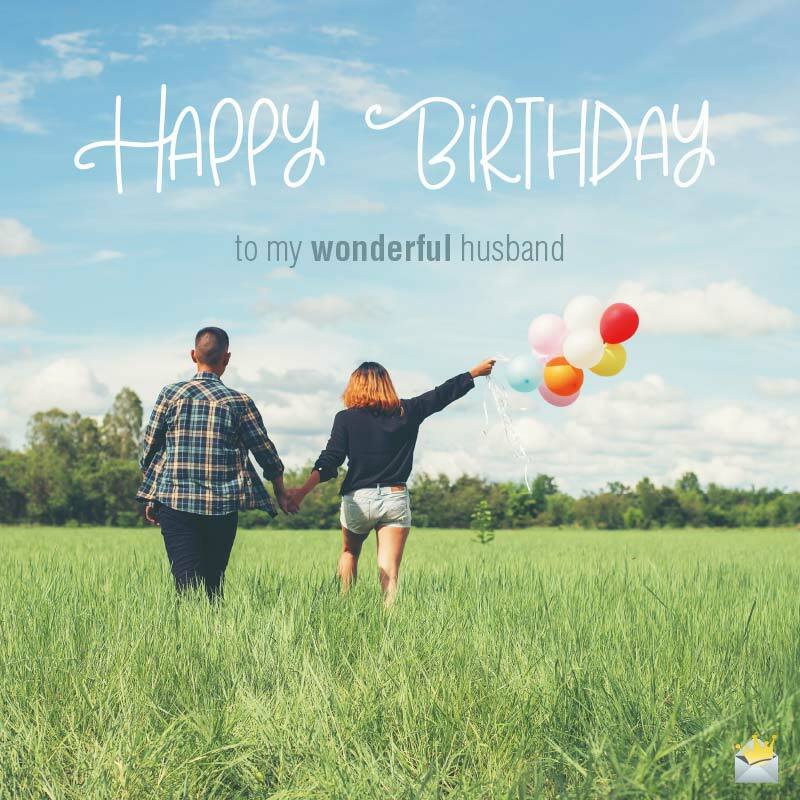 On this page we will treat you to a massive list of birthday wishes designed with the primary aim of making your hubby’s Big Day a fabulously memorable one! Wishing an utterly amazing birthday celebration to the world’s most fabulous hubby! It is a great honor and delight for me to call myself your wife. I will love you forever. All I want to do is make you happy and laugh every single moment of your life because your happiness is mine. Happy birthday, sweetheart. Wishing a truly gracious birthday celebration to the most special man in my life! Honey, I never thought that someday I would be able to finally say goodbye to sadness and loneliness until you came into my world. Thanks for constantly taking me to the highest point in paradise. As long as the universe continues to expand, you shall remain the only King of my heart. Happy birthday, my beloved husband. Just like the rays of the sun light up the world, so does your smile brighten every corner of my life. Happy birthday! I wake up each morning with a wide and bright smile because I know I am going to spend the rest of my life with you. Have an incredibly wonderful birthday today, my one and only true love! Not only are you the air that I breathe but you are also the sun that keeps me warm and the jewel that decorates my life. Simply put, you’re everything that is vital to me in this universe. Happy birthday, my love. Happy birthday to my extra special husband and best friend! Honey, I can never face this life without you and your precious love. 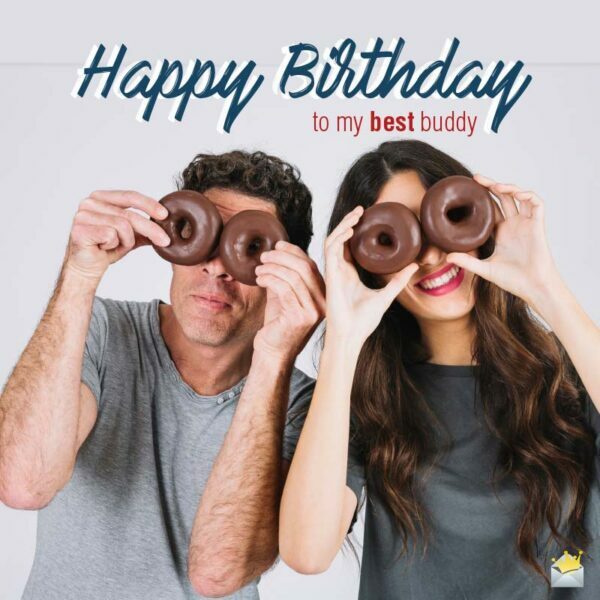 Happy Birthday to my best buddy. Babe, on your birthday, may the heavens watch over you constantly and bless you with all the joy that your sweet heart can hold. Have yourself an absolutely joyous and blessed day today. Happy birthday! I love you more than any natural or artificial thing on this planet. Dear darling, wishing you all the joy and blessings in the world as you commemorate your birthday. With you by my side, even when the road I’m traveling on gets hard, I never want to give up. Many a woman searches the universe just to find a wonderful husband like you. Words can’t express how blessed I feel to have you. Happy birthday, my dear. You are now officially as old as anyone could be. May God give you the presence of mind to deal with old age. Happy birthday. Happy birthday! Tonight, we are going to party until your mama calls. Today is definitely worth celebrating. You’ve done what a lot of people can’t do. You’ve aged! Happy birthday, sweetheart! Happy birthday! May your life be more beautiful than Beyoncé. Darling husband, my love for you is as real as America’s crazy love for guns. Happy birthday. Happy birthday, my sweet hubby! You know if our money multiplied as rapidly as your age, we’d have paid off our mortgage a long time ago! Happy birthday! Congratulations on giving old age your best shot! Dear husband, if aging were the promotion of peace, I strongly believe you’d have absolutely no difficulty earning the Nobel Peace Prize. Happy birthday! Happy birthday, my dearest hubby! Celebrate this grand day of your life knowing that I love you more than Colin Kaepernick loves kneeling down for his country’s national anthem. Wishing a fabulous birthday to my incredibly brave hubby! Old age is not for the faint of heart. Happy birthday! Babe, at this juncture, I warmly recommend you to take it easy on aging. Sweetheart, on your 40th birthday, may the good Lord make your happiness and prosperity His priority. Have a blast! Happy 40th birthday, darling! You’ve been the rock that has kept my life sturdy and happy all these years. Thank you for making me feel like a queen every time we are together. On this special day, God blessed you with the greatest gift in the universe – life. Don’t let anything hinder you from enjoying it and living it to the fullest. Happy 40th birthday! Age 40 is where all the joy and beauty in life begin. Enjoy them to the max! Happy 40th birthday, babe. Happy 40th birthday, darling. Thank you for adding so much color to my life. Eternal prosperity, peace and bliss are all I wish for you on your 40th birthday because I love you so. Have a fabulous day, darling. Tonight, you and I are going to dance like we’ve never danced because it’s the first day of one of the most amazing periods of your life. May happiness always linger in your world. Happy 40th! Happy 40th birthday, sweetheart! 40 is the age where life truly begins. I hope you find every second of this remarkably great age truly joyful. 40th Birthday Wishes | Crisis? What Crisis! Wishing a super duper 50th birthday celebration to a remarkably amazing husband! Honey, may the hand of the Lord always be upon your extraordinary life. I love you. Life is beautiful. Now that you have turned 50, it is even more beautiful. Happy 50th birthday! 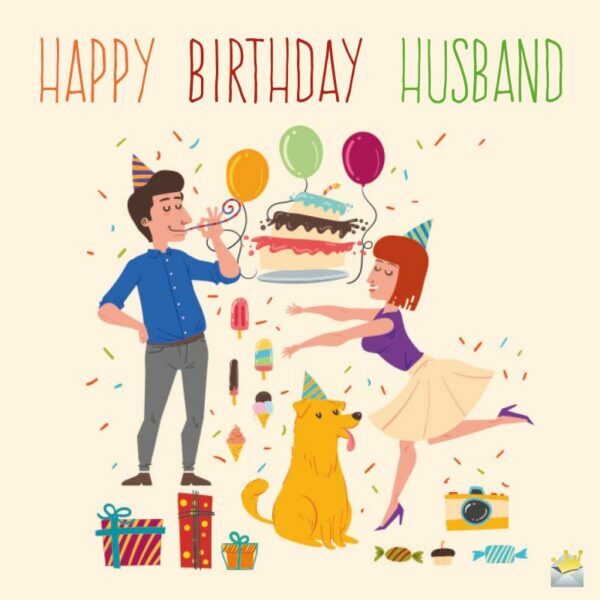 Wishing a happy birthday to a fabulous husband who turns fabulous 50 today. May all the bliss you deserve in life find you wherever you go. Here’s to your 50 awesome years of existence on this planet! For five decades, you have been an exceptional blessing to all who know you. May you continue blessing this world with your life. I love you so much. Happy 50th birthday. Honey, thank you for giving me the sweetest life in the world. May the Father of all creations bless you abundantly on your 50th birthday. Happy Birthday to my wonderful husband. Happy 50th birthday! You have reached one of the most remarkable chapters of your life. I’m beyond elated to share this great occasion with you. May all the good things in the universe flock over to you today and forever. Being with you has been the best journey of my life. Happy 50th birthday, honey. Happy 50th birthday! May God continue to transform your life into something truly special and wonderful. Just like spring brings gardens alive, may this great day make your life blossom and flourish beyond your wildest imagination. Happy 50th birthday! Happy 50th birthday to the greatest love of my life. May nothing stop you from winning and being happy all the time.